The Krueger Middle School Science and Advanced Technology program held a rocket launch day on Saturday, May 11. The students competed with 3-foot scale models of German V-2 rockets, using I-class engines for power. High winds unfortunately kept the smaller rockets from launching and put a bit of a damper on events, but the students persevered. As this picture shows, even the larger V-2s were affected by the winds. Still, between the V-2 launchess and the NASA Math Challenge program, the day was kept full. A good crowd turned out for the launch, and quite a few teams were able to compete. 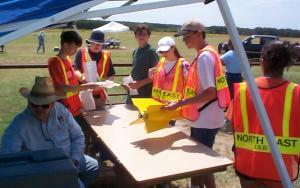 The rocket prep table kept busy, and many of the rockets carried an electronic payload of various types. Some of these payloads included data or video downlinks, allowing a video recorder or computer on the ground to receive information from the rocket during the flight. As the final step before flight, each team took their rocket to the motor load station to get a flight motor installed. These I-class rocket motors are fairly powerful, and strict safety precautions are followed to insure that no accidents happen. These engines performed well, but were powerful enough that hot exhaust residue started a couple of small grass fires during the course of the day. The teams were prepared for this, and each fire was quickly extinguished with the fire extinguishers kept handy for just such an occurance. 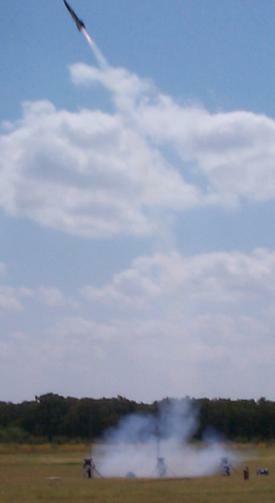 Each team took their rocket out to the launch field in turn, with everyone having their own part to play. Some of the team members went to the tracking stations to assist in tracking their flights. 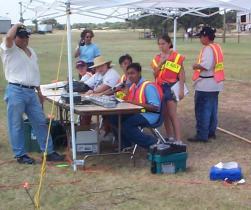 Others placed the rocket on the launch pad, and the team captain took charge of the launch control station. Once the rocket was in place on the launch pad, the team gathered at the launch control station. The team captain introduced the team members, and began the launch process. First, a check with the weather team, and a broadcast over the PA system of the current weather conditions and the details of the launch site position (latitude, longitude, and altitude). Next came a check-in from each of the tracking stations. Once everyone was ready, the team captain would give a brief countdown and press the launch switch. The rockets launched with a surprisingly loud noise, weathercocking into the stiff wind as they left the launch pad. Once the rocket launched, its flight was tracked and monitored. The tracking stations reported back the azimuth and elevation numbers for the flight, and the recovery team watched the direction of the descent so they could head out in the right direction to gather up the rocket once it landed. After a successful flight, the tracking information was used to calculate the rocket's actual performance for comparison with the predicted performance calculated before the flight.